Starting with the bottle itself, we wanted to honor the origin of honey—we turned to Baltimore Glass Decorators to silkscreen Dry Run Honey’s delicate wildflower illustration directly onto the jars. This provided a stunning canvas for the clean, modern lid closure label and jar label, tying everything together in a beautiful and cohesive way. From top to bottom, each feature of this design connects. The lid closure label tops everything off, honoring Dry Run Honey’s brandmark enclosed within a signature honeycomb, and down its slender side, the company’s tagline, “PURE. LOCAL. 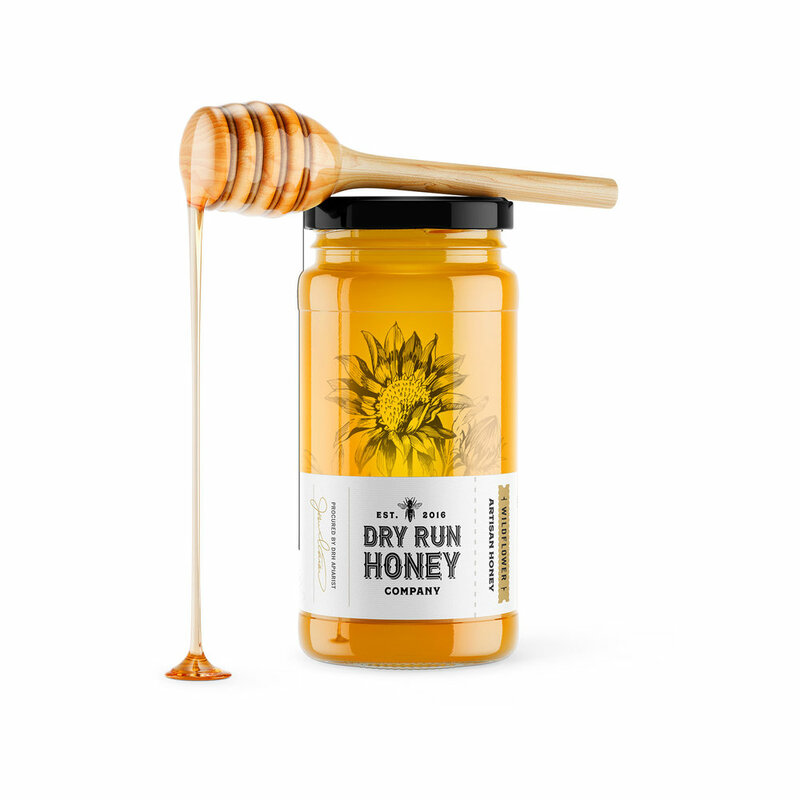 SWEET.” We carefully designed this label to merge perfectly with the wrap-around jar label that showcases the Dry Run Honey logo, series’ flavor, apiarist’s signature, and important raw honey instructions. The added bonus of the silk screened illustration and the label’s strategic low placement: eye-catching golden refractions produced by the wildflower that shines through the golden honey within.